Rolls with buckwheat, Stuffed cabbage. Recipes from Russia. 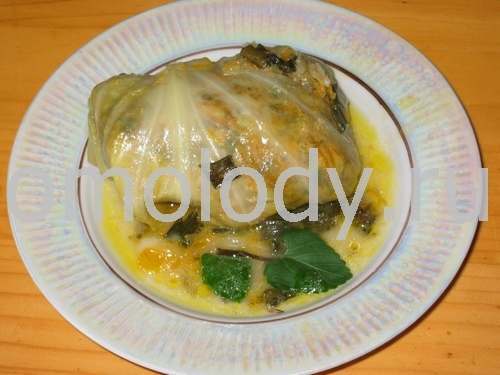 Stuffed cabbage rolls with buckwheat. 1. Cut around the stem of the cabbage, leave whole, and parboil for 5 minutes. Let it steep for another 5 minutes. Remove from water and drain. Separate cabbage leaves carefully for the rolls. 2. Put buckwheat in to boiled water and cook. Add butter. Flavour with greenery and salt. Mix. 3. Place the mixture on each leaf and fold up envelope fashion. Coat in the flour. Lay flap down in greased pan and fry both sides. Than pour over rolls sour cream and bake in the oven. Serve hot.